Candari: The mysterious Candari hail from the lands of Dayrmacia. A people of legend and myth, these folk are hardly seen beyond the Northern Reach. Little is commonly known or spoken of the Candari, outside of their amazing ability to hone the five senses and their pagan worship of the Shattered Pantheon. Personality: The Candari are a people of great secrecy, the few that travel the lands of Tharstelding are often regarded as alien by more civilized folk. While culture and lifestyle separate these people from the common races, over time they usually adapt to local customs and traditions, some have even been known to pay homage to the Five. Candari are often quiet and observant, taking in the surrounding circumstances and terrain before reacting, this is due to their ability to hone the senses which most of the common races can never relate to. Prone to judgment and calculating thought, they are often regarded as slow witted or docile by those that do not understand them. The occasional Candari will exert traits of curiosity and a thirst for knowledge, this too can be attributed to their honed senses. In fact most Candari seen south of the Northern Reach exhibit these traits, which is often the reason they leave their homeland. Physical Description: Candari resemble humans, and are often mistaken for them in the lands of Tharstelding, they do however display unique physical traits uncommon with their human counterparts. 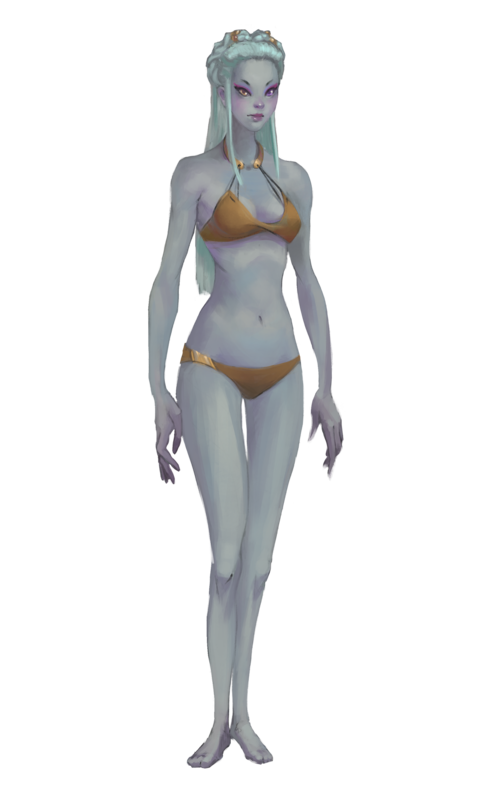 All Candari have ghost white skin and hair, they stand about as tall as a human of the same gender and live for about as long. Candari have elongated fingers and only four toes on each foot, they are often lithe or slightly built. Their eyes are the most common way to differentiate them from the typical human, they appear more almond shaped than round with hues that range from red, violet, purple and orange. About half of all Candari have two different eye colors, greatly decreasing their ability to blend in human societies. Relations: The people of Tharstelding know little outside of legend regarding the Candari, the further one is from the Empire of Tirmordane the less the average person seems to know. Most Mordanians know about the settlement of New Dervarn and how it was mysteriously razed in 2277 CM. The Empire has not officially blamed the Candari, but they have raised suspicions. Thirvolans tend to accept Candari more so than the other common races, seeing them as fellow pilgrims in a foreign land when encountered. Humans on the other hand often react with suspicion and distrust upon meeting their first Candari. Elves, dwarves and the less common races are less predictable when the two races meet for the first time. Alignment: Candari range in all aspects of alignment, however most that travel to the shores of Tharstelding lean to the chaotic side of the alignment compass. In their homeland most Candari pay homage to the countless gods of the Shattered Pantheon, and as such their moral and ethical views are guided by whatever deity they decide to revere. Candari Lands: The Candari hold no lands within the realm of Tharstelding, but within the massive expanse Dayrmacia they are the uncontested masters of civilization and technology. Those that speak of their homeland tell tales of cities that stretch from horizon to horizon and into the very heavens, rivaling the most expansive of local metropolises. while the Candari profess they do not keep kings and emperors, they speak of septarchs who rule city states and archvols who control many city states. The idea of land ownership outside of their walls is alien to the Candari who claim that the storms of their homeland and the unspeakable terrors that lurk at night own what cannot be walled off. Religion: Most Candari worship one or more of the Shattered Pantheon, their civilization is old, by account much older than the records of the Calendar of Man. They proclaim to be the original human race, and that the god Ser Deckmontaris created them prior to making the humans of Tharstelding. Their homelands and cities are house to thousands of temples and shrines, the idea of worshiping a single god as the people of Pax Thallos revere is alien to their culture. Nonetheless some curious Candari are drawn to the Five as they were drawn away from their homeland. Languages: Candari speak Candari, a complex verbal language that comes across as whispery and scratchy to people that cannot understand. When their words are drawn their characters appear like waves and boxes to the untrained eye. The Candari people proclaim their civilization keeps great libraries, however they do not write books and instead carve their literature on multi-faceted crystals or glass with longer texts taking up strings of large beads, the Candari language works best when viewed in multiple directions, they often have a hard time learning languages that are flatly written upon paper or parchment. Names: All Candari have four names, a name bestowed by their father, one by their mother, and a hyphenated last name drawn upon the lineage of their parents (each first name of their parents). Male names are often simple and short, female names are more elaborate and multi syllabled. Named at birth, common Candari male names include; Oosor, Puvvot, Reaat and Kekka. Common female names include; Lissamari, Quazziya, Zeladorra and Lasca. Common last names include; Kekka-Lissamari, Oosor-Lasca, Reaat-Zeladorra and Puvvot-Quazziya. Candari names are hard to pronounce in the common tongue, so most that travel to Tharstelding adopt common names or nicknames they find acceptable that the locals can understand. Adventurers: The desire to leave Dayrmacia for Tharstelding is an uncommon trait among the Candari, nonetheless it does happen. Adventuring Candari are often called Yull by other Candari, a word that in their native tongue means wanderer. Adventuring comes easily to this race, with their honed senses they quickly can earn the trust of most adventuring companies in search of a good scout or a fresh perspective on situations that commonly arrive when delving deep into scary dungeons. +2 Wisdom, +2 Dexterity, -2 Charisma: Their elongated fingers give a Candari exceptional dexterity, their honed senses also make them more attuned to their surroundings. However their alien appearance and personality often set them aside in Tharstelding culture. Medium: Candari are medium creatures, as such they gain no bonus and suffer no penalty from size. Human Subtype: For all intents and purposes, Candari are considered humans for any game effect or mechanic that relies on race. Normal Speed: Candari have a base land speed of 30 feet. Honing: Each Candari has the ability to hone one of their five senses, the process takes 1 hour of concentration, once a sense is honed it will remain honed until the Candari chooses to hone another sense. Taste: The Candari can tell if any food or water is safe for consumption by taste, they can use their sense of taste to aid in the identification of potions or poisons if they have the required ability to normally identify such items. This confers itself as a +2 racial bonus to any identification check for potions or poisons. The use of this ability requires a standard action each round it is used. The identification time of a potion or poison is not affected by this ability. Sight: The Candari gains dark vision as an extraordinary ability to a range of 60 feet. Touch: The Candari gains tremor sense as an extraordinary ability to a range of 10 feet. Hearing: The Candari gains a +4 racial bonus to all perception checks in which hearing is related. In addition, when the Candari is sleeping they can hear and comprehend all noise around them as if they were awake, they can chose to wake at any time as a free action if they are sleeping, this ability is suppressed under the condition of a magical, chemical or supernatural sleep effect. Smell: The Candari gains the scent trait, this is an extraordinary ability. Naturally Tactile: A Candari gains a +1 racial bonus to any dexterity related skill or dexterity check that requires the use of their hands exclusively. Exotic Appearance: A Candari has a hard time blending in with the people around them, anyone associated with and in the presence of a Candari suffers a -1 penalty to all charisma based skills while the Candari is in view. Focused Body, Focused Mind: A Candari gains a +2 racial bonus to all concentration checks. If struck with an attack of opportunity during spell casting or if under the effect of continuous damage the Candari’s racial bonus to concentration increases to +4. Pure Focus: Once per day per 4 class levels (minimum 1, maximum 5 at 20th level) a Candari can add double their wisdom bonus to a single perception check. Limited Common: A Candari does not begin play speaking fluent common, they understand the most basic of words at the DMs discretion. They may spend a skill rank in Linguistics at 1st level in order to fully understand common. Languages: A Candari Speaks Candari and limited Common, see above. Bonus Languages: Draconic, Celestial, Abyssal, Infernal, Giant and Undercommon. Candari of higher intelligence learn less common languages than those spoken in Tharstelding at they are more prominent in Dayrmacia.